DALLAS – The original artwork for the recent three comic strip collaboration between Bill Watterson, the cartooning genius behind the much-loved Calvin and Hobbes comic strip, and Pearls Before Swinecartoonist Stephen Pastis – taking place in a three day run in June 2014 in Pearls – will be sold at Heritage Auctions on Aug. 8, 2014, with proceeds from the sale benefitting The Michael J. Fox Foundation for Parkinson’s Research. The collaboration between the two artists came at the suggestion of Watterson and was immediately embraced by an overwhelmed Pastis, who, like some many modern cartoonists, was greatly influenced by Watterson and Calvin and Hobbes. The trajectory of the three strip arc follows Pastis’ comic strip alter-ego as he turns the drawing of the comic over to a precocious second-grader named Libby for three days. The results are both wickedly funny and uniquely Watterson, while remaining true to the sharp humor that defines the Pearls Before Swine strip. 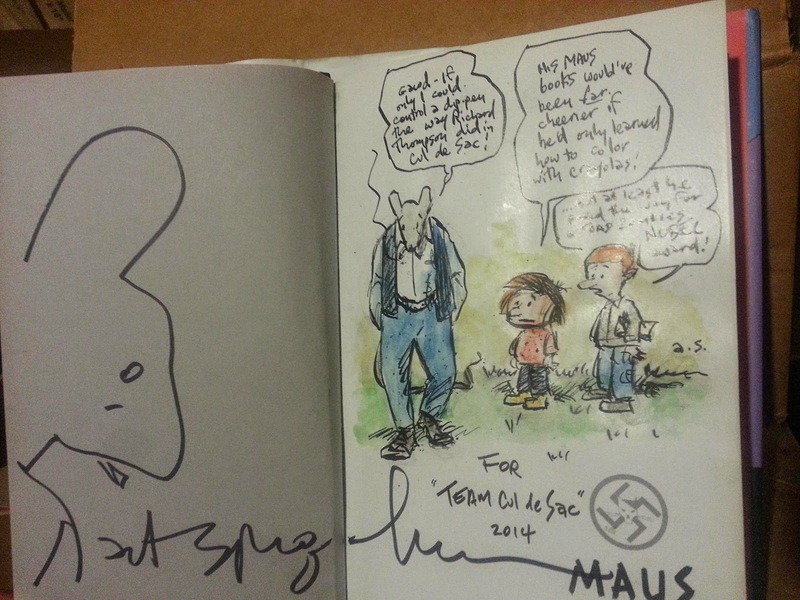 At Watterson’s request, the artwork is being sold on behalf of Team Cul de Sac, a non-profit charity established by editor/designer Chris Sparks on behalf of Cul de Sac cartoonist Richard Thompson, who is battling Parkinson’s Disease – a piece of artwork done by Watterson depicting one of Thompson’s Cul de Sac characters sold in 2012 as part of a charity auction to benefit Team Cul de Sac – and the profits from the sale of the original art (Heritage is waiving the seller’s fee on the artwork and will also contribute half of the Buyer’s Premium) will be donated to the Michael J. Fox Foundation for Parkinson’s Research. Heritage Auctions is the largest auction house founded in the United States and the world’s third largest, with annual sales of more than $900 million, and 850,000+ online bidder members. For more information about Heritage Auctions, and to join and receive access to a complete record of prices realized, with full-color, enlargeable photos of each lot, please visit HA.com. On Thursday I arrived at the Convention Center and Shelton Drum grabbed me and off to the local CBS station we went. Next thing I know we are on the air discussing the con, Drink and Draw and those beautiful Watterson/Pastis strips. The whole weekend was great and I had a blast catching up with old friends and making new friends but we can get into all of that fun stuff later. Here is the BIG news! We still have 3 strips by a pair of cartoonists to auction off in August. A big thanks to everyone involved this past weekend! WOW! I will share more soon! I'm continuing through Cul de Sac tearsheets from the Post Magazine, and ran across notice of a 2006 Washington Post chat with Richard Thompson that I had also forgotten. Who knows what evil lurks in the hearts of men? A big Thank You to Jim Horwitz for providing us with such a great auction item(s). Jim and I met at the NCS awards a few years ago and I just can't tell you how wonderful he is. So don't ask ok? Jim asked me a couple years ago if I ever needed anything to let him know.Well I did this time and he jumped in to help ASAP! Thank you so much Jim! Creating this collection of original “Watson” art for Team Cul de Sac was a great thrill. is an absolute good and I’m honored to be a part of it. 1) Ten 3.5-inch Retro Watson floppy disks, all hand-detailed with original “Watson” art. 2) An 8” x 11” original Watson drawing on acid-free archival quality paper. Labels: Miss Bliss, Shannon Gallant. 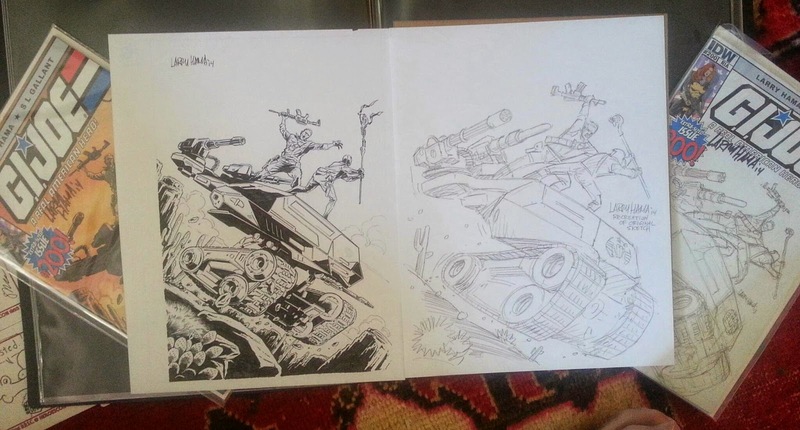 Editorial cartoonist Steve Artley drew 2 cartoons for our Team Cul de Sac auction next weekend! He also drew some coasters too, while waiting for Stephan Pastis to start talking. 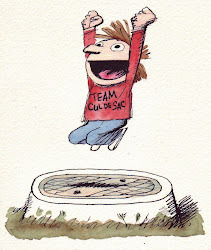 Steve is in the Team Cul de Sac book also. Shannon helps us every year at the drink and draw. He always wants to do whatever he can to help raise awareness and funds for the Michael J Fox foundation. Richard and I not only consider him one of the founding members TCDS but also a wonderful friend. 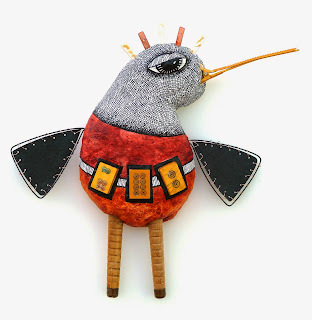 Hama. We also have comics sign by Larry also. 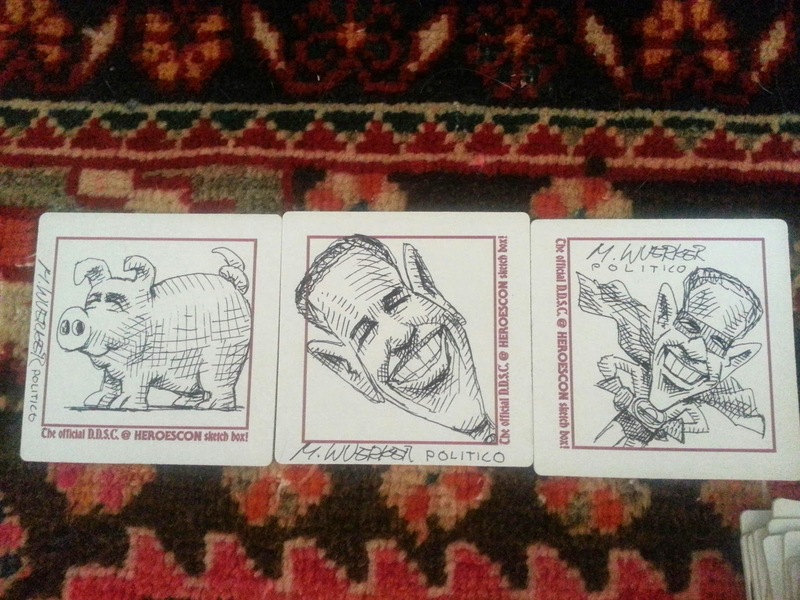 Matt Wuerker is Pulitzer Prize winning editorial cartoonist who lives in the D.C. area. 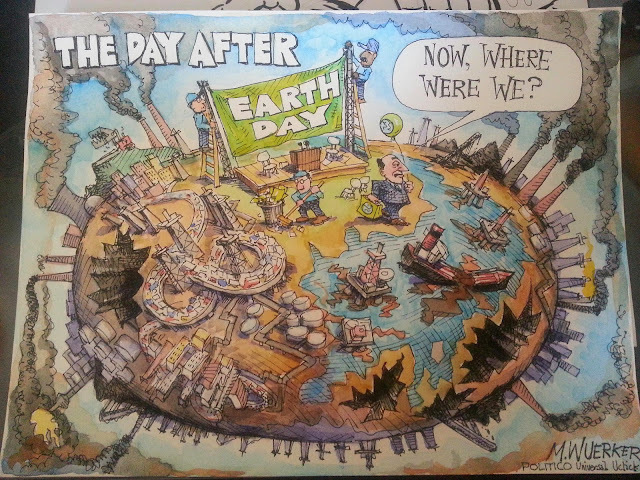 Matt always donates art to us and beyond this beautiful watercolor of Earth Day, we also have some cool coasters he scribbled on! 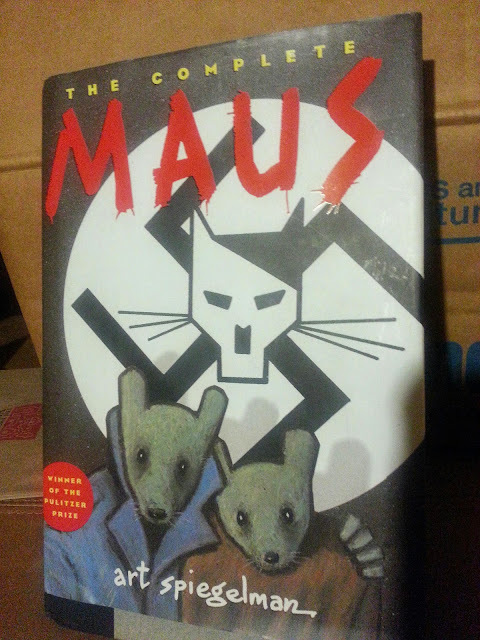 Art Spiegelman is a big fan of Richard Thompson. This is beyond rare. This is history. A DC-based greeting card cartoonist, Teresa Logan has given us two pieces of art to auction - 1 painting and the "framed piece is an original gouache and pen on paper". These will be available next weekend at the HeroesCon auction. Photos courtesy of Bruce Guthrie.